Have you ever considered paver patios to add an architectural view to your outdoor spaces? Or, do you have a concrete patio that’s cracking, sinking, or just weathered beyond repair? 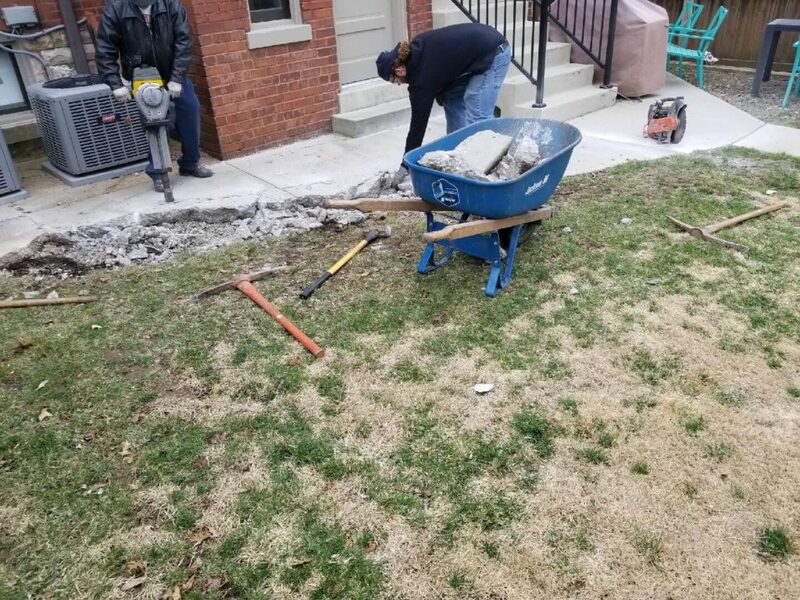 With the extreme weather fluctuations in St. Louis, it’s common to have shifts in concrete patios in nearly every season throughout the year. Paver patios continue to grow in popularity due to the amount of flexibility they provide during the design phase of your project. And, they look really great! We find most people install paver patios instead of decks or concrete as it provides a much more unique appeal to their landscape, and it’s usually easier to repair. We couldn’t agree more, paver patios are a great alternative to traditional concrete patios or decks. Not only are patio pavers a beautiful addition to your landscape, but you can customize the designs utilizing a variety of layouts and stone choices. Ready For a New Paver Patio? Paver patios are the types of patios you see where they are made from individually places stones in a decorative pattern. Pavers are often used for patios, driveways, pool decks, and walkways. Because of the various sizes of stones or paver material, the finished product often has a very custom and weathered look. This is one of the main reasons people love to use paver patios in their landscape. Below are 3 reasons people love paver patios. Paver patios provide a great place to enjoy your outdoor spaces. Below are the various types of patio pavers you can choose from. You can commonly find 12×12 concrete pavers or 24×24 concrete pavers. Additional sizes may be available upon request during the design phase of your project. Concrete patio pavers can also be stained if you want to use a custom color. Brick pavers provide a very unique look to your paver patio. One of the really great things about brick patio pavers is you can get extremely creative with your designs based on how easy it can be to cut brick. And, using brick makes paver installation much easier due to the consistency of the sizing of each brick paver. Natural stone paver patios will not disappoint. Using natural stone pavers for your patio will give it the custom look it deserves. Paver installation using natural stone takes a little more creativity as the size of each stone paver is different. Paver patio installation can be one of the toughest DIY landscape projects you can take on. Because it takes time and patience. You’re not just digging up the yard and laying stone, there is a very detailed process that you must follow. And, if you skip any steps, you’ll find your self with a sinking patio very soon. We recently installed a paver patio (pictures below) in the rear of a home where the home owner had issues with their old concrete slab. It took a while to remove the concrete and then we were left with open ground to begin prepping. We first leveled out the ground as much as possible and then added our base and sand. Laying pavers without base is one of the biggest mistakes most people make when trying to install a paver patio. Laying pavers without sand is the second biggest mistake most homeowners make when trying to do a DIY paver patio. If you’re not prepared to follow the steps, then you’re setting yourself up for failure. 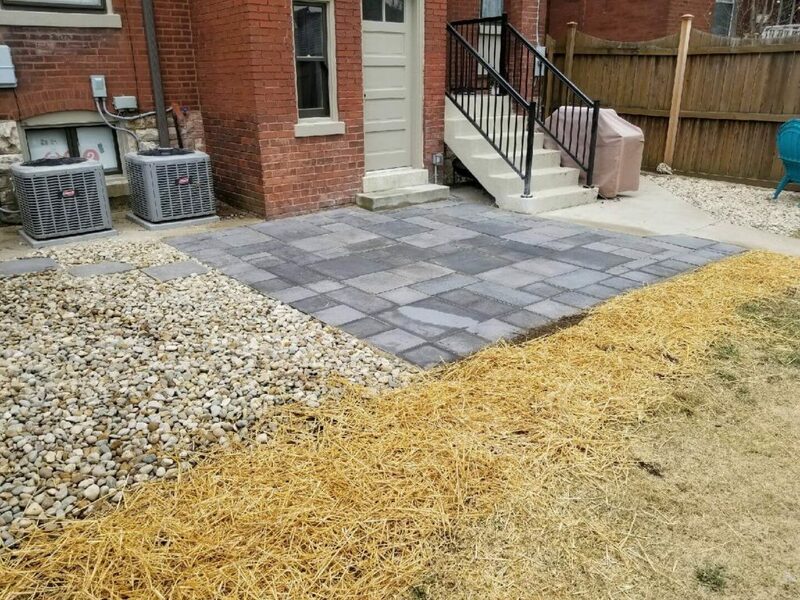 That is why every paver patio we install follows a strict checklist to ensure you are going to have a stable patio for years to come. Why use stone pavers for your patio? Most people tend to want stone pavers over any other material, likely because it looks natural, which is the ultimate goal when creating a landscaped place in your back yard. Stone pavers are beautiful and the natural textures are one of the main reason customers choose stone pavers for their patio or walkways. Aside from looking good, stone pavers are extremely durable! Stone has clearly been used for thousands of years. If the Romans ruled the world by building stone paver roads, you can be confident your stone paver patio will hold up even better! Lastly, stone pavers provide incredible designs. You can find stone pavers in many sizes and colors. Our design team can help you pick out the best paver patio layout. You have many options for small paver patio designs or even larger projects. Many of our clients choose paver patios in smaller spaces, but the size doesn’t impact the design. Below are some of the commons paver patio designs you can choose from. Our most recent paver patio project we mentioned earlier was a great success. 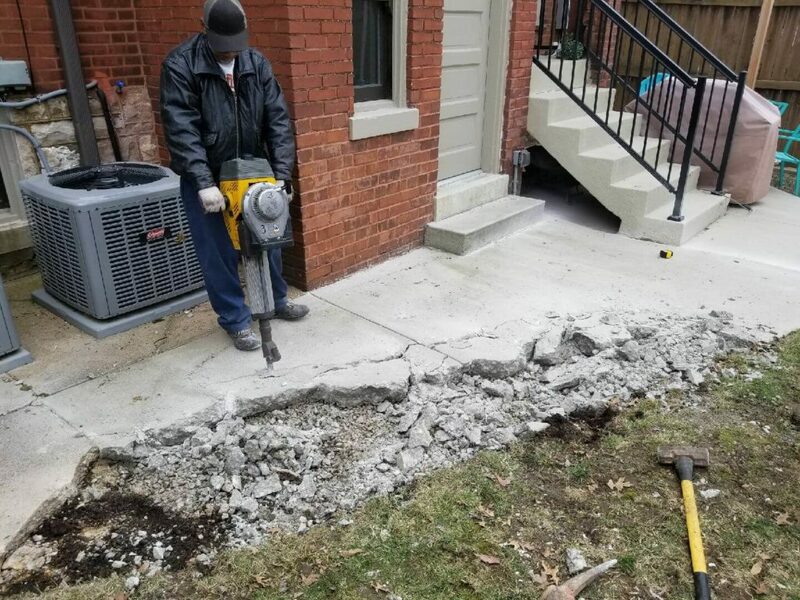 It’s the perfect example of how we were able to help our customer remove an old and cracking concrete patio and replace it with a new paver patio. If you’re looking to install a paver patio at your home, please give us a call. We service the entire St. Louis area and specialize in paver patio installation, regardless of the materials used. Give us a call and we’ll happily discuss the process and help you think through the best type of pavers for you patio. Need A Paver Patio Bid? St. Louis Lawncare is your local resource for installing paver patios. It’s a job we know how to do extremely well. We could continue all day talking about paver patios, but most people would rather just talk it through. 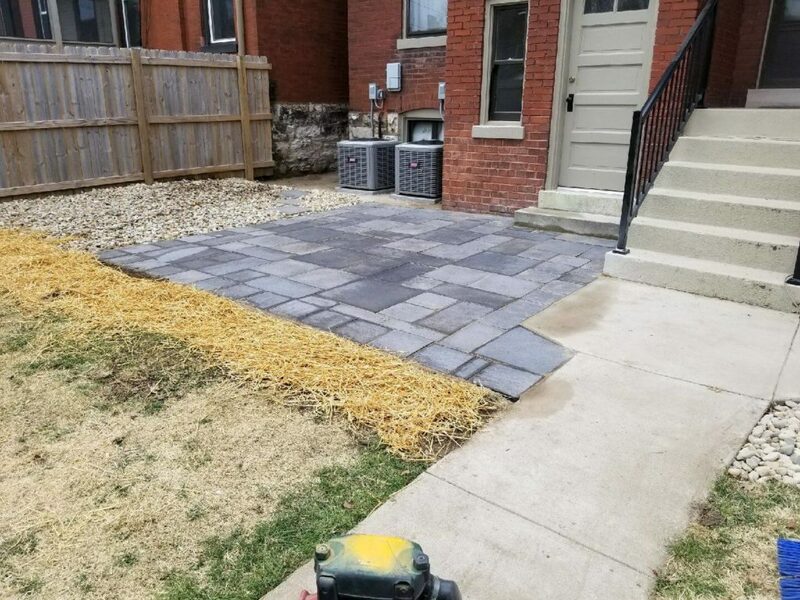 It’s our job at St. Louis Lawncare to provide you with exception service, and part of that service is taking the time to talk through the design process. If you’re interested in paver patios for your home or business, we would be happy to sit down with you and talk through the different options you have. Creating paver patios can be difficult if you aren’t familiar with all the steps it takes to complete. Our team will not only educate you on our process, but we’ll make suggestions that will help you visualize what your new paver patio could look like. Need a paver patio installed? Call the team at St. Louis Lawncare at 314-974-5911. Today on the front page of STLtoday.com they had an article titled 10 Easy Ways to Increase You Homes Curb Appeal. This list had landscaping and lawn at the number one and two spots on the list. And they are right, there is nothing that can improve how the outside and presentation of your house looks better than landscaping and the health and look of your lawn. The right landscaping will accentuate your house and lawn. The landscaping should be inviting and have a flow to help the features of your house stand out. St. Louis Lawn Care has the experience and expertise to customize a landscaping for your house. Everyone knows how a healthy lush lawn can make a home look more inviting. Neighbors have been battling for years over who has the best lawn. St. Louis Lawn Care can help you achieve the lawn that your neighbors will be envious of. Whether you need lawn mowing, fertilizing, aerating and overseeding or any other lawn maintenance service. We provide top notch service to help you have the lawn of your dreams. This spring in St. Louis has been unusually wet. But, it has give us some deep waterings. The deep waterings help root growth. It is better to apply one deep watering to the lawn than to water for a few minutes multiple times per week. The deep watering encourages roots to grow and develop deep within the soil. Ideal watering is one deep watering once a week. Even in the heat of the summer, one or two deep waterings is better than watering for a few minutes every day. This rain in the spring shows how beneficial deep waterings can be for your yard. Lawns are growing and looking healthy. The lawns are growing at a tremendous rate here in St. Louis. If you are unable to keep up with the lawn mowing give St. Louis Lawn Care a call. St. Louis Lawn Care will give your grass a professional looking cut. It is amazing that not all of the leaves have fallen from the trees. The strange weather this fall in St. Louis has kept the leaves on the trees much longer than the average fall season. If all of the leaves have fallen off of your trees be sure to clear them off of your lawn. St. Louis Lawn Care can clean up the leaves and give you one last cut to prepare your lawn for the harsh St. Louis winter. The grass has stopped growing and the lawns should be mowed one last time for the winter. Mowing your lawn before the dormant season will allow your lawn to get the much needed moisture throughout the winter. It looks like most of the leaves have fallen from the trees and are all over the lawns. There is still time before the first snow to get them cleaned up. I cleaned up a few yards this past week and the lawns looked beautiful after they were completed. By removing the leaves this allows the grass to get much needed sunlight during the winter months. I am also giving the lawns the final cut and mow for the season. It is crucial to cut the grass after it stops growing to get the grass at the right height for the St. Louis winter. If you need a reliable lawn service please give Tim a call at 314-974-5911. We offer many services to make you lawn look great.